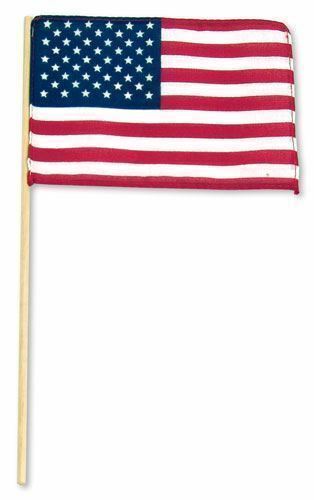 12" x 18" plastic flag on 30" staff. Our flags typically ship in 2-3 business days - adding Flag Staff Cards will add production time to your order. Please account for this time and UPS Ground shipping when placing your order to ensure on-time delivery. Call us at 800-789-6247 if you have any questions. 3-mil, polyethylene flag (comparable to a Ziploc bag). Pole-hemmed and securely double stapled to smooth-sanded, wooden staffs. "Made in USA" printed on hem of flag.